Tucked into a corner of the basement is a 1937 Seagrave Safety Sedan, known amongst fire truck junkies as the Detroit Safety Sedan and it represents one of the more interesting untold stories here at Detroit. When a firefighter falls in the line of duty, there is a longstanding tradition of using a firetruck as the funeral hearse to honor the family and the deceased. The tradition of the final ride has become difficult, as fire trucks have grown in size and height. Seeing the problem, the Detroit Fireman's Fund Association decided to set out to do something about it. The organization decided the best way to serve the duty and keep operational firetrucks ready for emergencies at the same time would be to set out to purchase and refurbish a classic pumper truck. 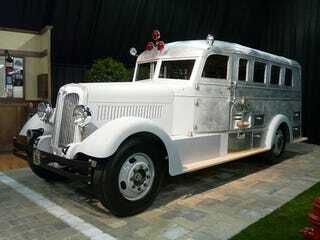 Seagraves were the predecessor the the later dominant Mack offerings, but at the time the Detroit Fire Department owned about 80% of the Safety Sedans ever made. The example we see here was one of the early Seagraves in the DFD fleet of 87 total. The original chassis has been replaced with a modern one from Mack, and Chrysler was generous enough to contribute a new Detroit Diesel power plant. Nearly four years of labor and dedication have gone into getting the truck to this point and the craftsmanship is unbelieveable. We're sure when it's finished, the hours of hard work from countless volunteers will be well worth the effort. If you'd like to contribute the effort or just want to know a bit more, you can go directly the Detroit Firemens Fund website.